Synopsis: Millions of years ago In the distant past, the spacecraft of an advanced humanoid alien race arrives on Earth. One of the aliens consumes a dark liquid, causing its body to disintegrate and fall into a nearby waterfall, thus seeding Earth with the building blocks of life. In the year 2089, archaeologist couple Elizabeth Shaw and her boyfriend Charlie Holloway discover a star map among the remnants of several otherwise unconnected ancient cultures. They interpret this as an invitation from humanity’s forerunners. Peter Weyland the elderly founder and CEO of the Weyland Corporation, funds the creation of the scientific deep space research vessel called the USS Prometheus to follow the map to the distant moon of LV-223 several light years from Earth. Review: I have often pondered the question of human existence. Who hasn’t asked the question “Why are we here?” or “Who is our creator?” Ridley Scott’s uses these themes in a number of his films such as Blade Runner where the androids question their mortality and wish to meet their creator to question him about the very reason they exist at all. 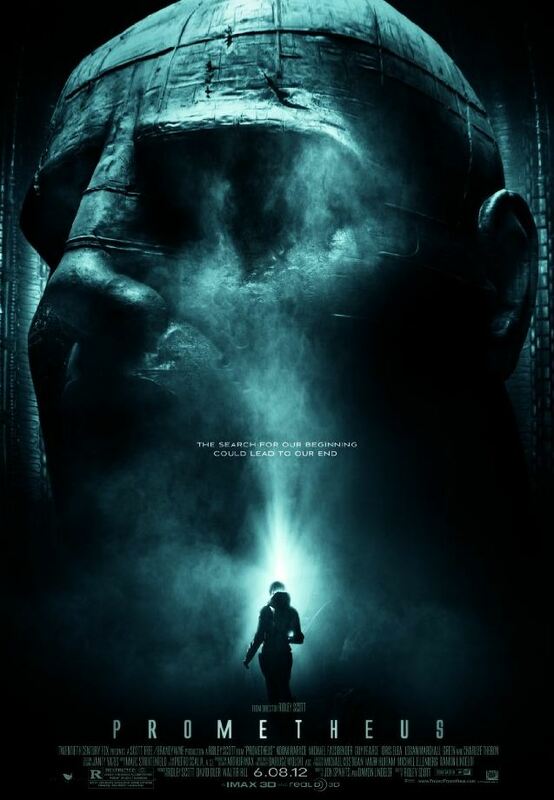 Scott’s films always draw you in by use of imagery as is the case of Prometheus with it’s H.R. Geiger designed aliens and spacecraft. The film is both intelligent in it’s search for answers to human creation and solid as a Sci-Fi horror/Adventure. The combination is sure to please most audiences and fans of the Alien franchise as well. Prometheus is so well crafted a tale that if you have never seen the Alien films it doesn’t matter because this film stands apart. Another running theme in Scott films is the tension between corporate funding and scientific discovery where human life is incendiary to the corporate mission. *(Spoiler Alert)* This plays out well in this story as Peter Weyland the head of the Weyland Corp. is old and dying and funds the trillion dollar mission to find immortality by meeting his creators. Scientists Elizabeth Shaw and her scientist boyfriend Charlie Holloway had thought they recieved the funding to find the origins of mankind as created by a human species who planted DNA as an experiment on Earth. (Read the Synopsis). Michael Fassbinder plays an android named David who studies ancient languages and human civilization was brought aboard the ship to communicate with the aliens and run the ship while the crew is in stasus for the two and a half year journey to the alien planet. His detachment/souless nature is played well by Fassbinder for he too is on a journey of discovery and lives to serve his creator. (Weyland) It occured to me the name David may be a homage to 2001’s Dave, played by Keir Dullea and to the detached HAL computer of the same film. David also has a curious fascination with the film Lawrence of Arabia and has a similiar hairstyle and physique of a young Peter o’ Toole as Lawrence. Charlize Theron as Meredith Vickers, plays corporate detachment to the hilt. It is her job to explain to the scientists that this is the Weyland corporation’s mission not theirs. She is ruthless in her self-determination for survival and making sure the mission goes as planned. There seems to be a secret she and David share, which no one else knows, that drives her loyalty to the company and her anxiuosness for the mission to end ASAP. Noomi Repace who plays Shaw, is as strong and driven as Sigourney Weaver’s Ripley from the other Alien films. Also the film asks more questions than it answers but who said the question of creation or “engineering” as it is referred to in the film, has an easy answer. Is human – kind an alien experiment in genetic engineering? The film does question this and shows us what might go wrong if you try to play God with DNA. The film deserves a sequel and perhaps this will answer some of the questions that were left unanswered. The film has a horror element that like the other Alien stories is a neccessary component of an Alien film. Scott seemed to be more interested in the tough questions of God, creation and man-kind’s existence making the combination of horror and intelligence elevate the film, tho at times I felt the gratuitus horror moments ditracted rather than enhanced. I am drawn to intelligent stories and I have to say it is nice to see Scott directing Sci-Fi with his knack for realism and provoking thought over violence. Had a great time viewing this movie and you will too.